Fixed Price contract – Unfortunately these are not very flexible and usually require a level of detail to define the outcome, which is counterproductive for Agile engagements. It does however incentivise the SI to use best practices to reduce the cost of delivery. Time and Material – This is the most flexible model that easily accommodates any scope changes. The challenge for this one is that the SI does not have an incentive to increase the level of automation because each manual step adds to the revenue the SI makes. Gain Share – This is a great model if your SI is willing to share the gains and risks of your business model. While this is the ideal model, often it is not easy to agree on the contribution that the specific application makes to the overall business. So what is my preferred model? Well let me start by saying that the contract itself will only ever be one aspect to consider, the overall partnership culture will likely make a bigger impact than the contract itself. I have worked with many different models and have made them work even when they were a hindrance for the Agile delivery approach. However, if I had to define a model that I consider most suitable (Ceteris Paribus – all other things being equal), I would agree on a time and materials contract to keep the flexibility. I would make it mandatory to do joint planning sessions so that both staff movements and release schedule are done in true partnership (it does not help if the SI has staffing issues the client is not aware of or the client makes any ramp-ups/ramp-downs the SI’s problem). I would agree on two scorecards that I would use to evaluate the partnership. One is a Delivery Scorecard, which shows the performance of delivery, things like: are we on track, have we delivered to our promises, is our delivery predictable. The second is an Operational Scorecard , which shows: the quality of delivery, the automation levels in place, the cycle times for key processes in the SDLC. With these elements I feel that you can have a very fruitful partnership that truly brings together the best of both worlds. This entry was posted in Uncategorized and tagged agile, delivery partner, devops, devopsSI on January 30, 2015 by Mirco Hering. These days a lot of organisations talk about Multi-Speed IT, so I thought I’d share my thoughts on this. I think the concept has been around for a while but now there is a nice label to associate this idea. Let’s start by looking at why Multi-Speed IT is important. The idea is best illustrated by a picture of two interlocking gears of different sizes and by using a simple example to explain the concept. The smaller gear moves much faster than the larger one, but where the two gears interlock they remain aligned to not stop the motion. But what does this mean in reality? Think about a banking app on your mobile. Your bank might update the app on a weekly basis with new functionality like reporting and/or improved user interface. That is a reasonable fast release cycle. The mainframe system that sits in the background and provides the mobile app with your account balance and transaction details does not have to change at the same speed. In fact it might only have to provide a new service for the mobile app once every quarter. Nonetheless the changes between those two systems need to align when new functionality is rolled out. However, it doesn’t mean both systems need to release at the same speed. In general, the customer facing systems are the fast applications (Systems of Engagement, Digital) and the slower ones are the Systems of Record or backend systems. The release cycles should take this into consideration. So how do you get ready for the Multi-Speed IT Delivery Model? Release Strategy (Agile) – Identify functionality that requires changes in multiple systems and ones that can be done in isolation. If you follow an Agile approach, you can align every n-th release for releasing functionality that is aligned while the releases in between can deliver isolated changes for the fast moving applications. Application Architecture – Use versioned interface agreements so that you can decouple the gears (read applications) temporarily. This means you can release a new version of a backend system or a front-end system without impacting current functionality of the other. Once the other system catches up, new functionality becomes available across the system. This allows you to keep to your individual release schedule, which in turn means delivery is a lot less complex and interdependent. In the picture I used above, think of this as the clutch that temporarily disengages the gears. 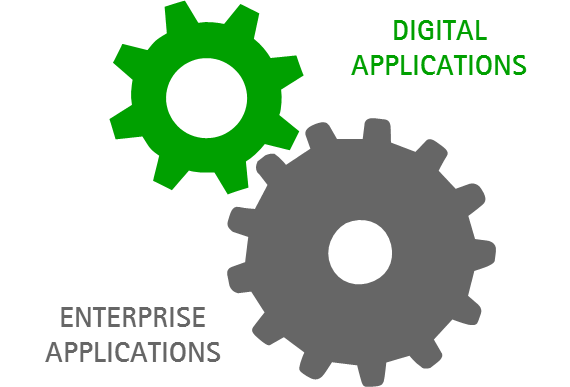 Technical Practices and Tools (DevOps) – If the application architecture decoupling is the clutch, then the technical practices and tools are the grease. This is where DevOps comes into the picture. The whole idea of the Multi-Speed IT is to make the delivery of functionality less interdependent. On the flip side, you need to spend more effort on getting the right practices and tools in place to support this. For example you want to make sure that you can quickly test the different interface versions with automated testing, you need to have good version control to make sure you have in place the right components for each application, you also want to make sure you can manage your codeline very well through abstractions and branching where required. And the basics of configuration management, packaging and deployment will become even more important as you want to reduce the number of variables you have to deal with in your environments. You better remove those variables introduced through manual steps by having these processes completely automated. Testing strategies – Given that you are now dealing with multiple versions of components being in the environment at the same time, you have to rethink your testing strategies. The rules of combinatorics make it very clear that it only takes a few different variables before it becomes unmanageable to test all permutations. So we need to think about different testing strategies that focus on valid permutations and risk profiles. After all, functionality that is not yet live requires less testing than the ones that will go live next. Partnership with delivery partners – It will be important to choose your partners wisely. Perhaps it helps to think of your partner ecosystem in three categories: Innovators (the ones who work with you in innovative spaces and with new technologies), Workhorses (the ones who support your core business applications that continue to change) and Commodities (the ones who run legacy applications that don’t require much new functionality and attention). It should be clear that you need to treat them differently in regards to contracts and incentives. I will blog later about the best way to incentivise your workhorses, the area that I see most challenges in. Application Portfolio Management – Of course to find the right partner you first need to understand what your needs are. Look across your application portfolio and determine where your applications sit across the following dimensions: Importance to business, exposure to customers, frequency of change, and volume of change. Based on this you can find the right partner to optimise the outcome for each application. Governance – Last but not least governance in very important. In a multi-speed IT world you will need flexible governance. One size fits all will not be good enough. You will need light-weight system driven governance for your high-speed applications and you can probably afford a more powerpoint/excel driven manual governance for your slower changing applications. If you can run status reports of live systems (like Jira, RTC or TFS) for your fast applications you are another step closer to mastering the multi-speed IT world. This entry was posted in Uncategorized and tagged agile, delivery partner, devops, devopsSI, multi-speed delivery on January 28, 2015 by Mirco Hering.